I drive a 2007 Civic Si, wich is posted up on the Honda thread, I am 25 years old and i stay out in claremont. Im the captain for Team X-Celerate, we have ben around for about 1 year and a half. we were of to a great start but then some stuff started going wrong in my life and i had no time so we lost a bunch of members. Im back and everything is fine now and im trying to get us back up and get more member to join. 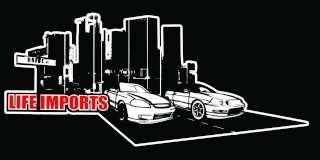 We are not into street racing or anything like that, I do how ever plan on making some by monthly meet to irwindale or local drag strip to get that errge out of us in a safe place. We love going to car meets and everything like that. Im hoping to get my car hooked up more so that i can start entering it in more shows, so far i have 1 award for best imoport at a local show so that was nice. I hope to get more members in our team and i want us to grow and be close and go to meets and show toghether. Hey whats up bro! Thanks again for joinging the forum and supporting what LIFEimports is about and what they would like to do. We hope that you and your team will help us grow as well, while joining us at or meets, events, and outside events as well. How many cars do you guys have in your Team? Don't forget to let your team know about our forum, and SICK RIDE bro. welcome... thanks for joining... hope you enjoy!